Wilkes read from and discussed his novel on the evening of April 19, 2018, at Barnes & Noble Booksellers as part of WKU Libraries’ Kentucky Live! Southern Culture at Its Best series. Wilkes also signed his books. Soleiman Kiasatpour, an Associate Professor of International & Comparative Politics in the Department of Political Science at Western Kentucky University, talked about “Morocco At the Crossroads of Europe, Africa and the Middle East” in our Far Away Places series sponsored by the Friends of WKU Libraries on the evening of April 12, 2018, at Barnes & Noble Bookstore. 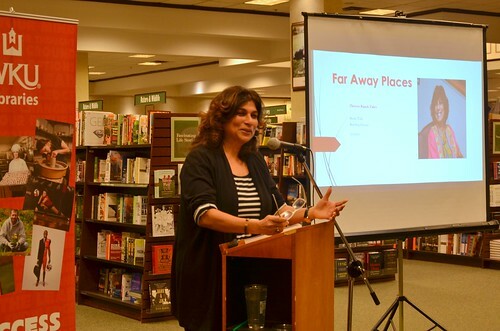 Theresa Rajack-Talley, Associate Dean for International Diversity and Community Engagement Programs in the College of Arts & Sciences at the University of Louisville, was featured in our WKU Libraries’ Far Away Places speaker series on Thursday, March 22, at Barnes & Noble Bookstore in Bowling Green, KY. The focus of her talk was also the title of her book Poverty is a Person: Human Agency, Women, and Caribbean Households. A book signing ensued in conclusion of her talk. WKU Libraries’ last of this semester’s “Kentucky Live!” speaker series featured Ann DAngelo, an attorney for the Kentucky Department of Transportation Cabinet on the evening of November 16, 2017, at Barnes & Noble Bookstore in Bowling Green, KY. She talked about and signed her new book Dark Highway about the case of Verna Garr Taylor’s death on the night of November 6, 1936. 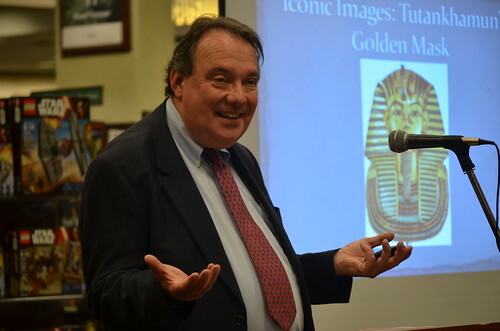 Historian Ron Fritze, Dean of Arts & Sciences at Athens States University, was the featured speaker in WKU Libraries’ April Far Away Places series on Thursday, April 13, 2017 at Barnes & Noble Bookstore, Bowling Green, KY. Fritze talked about his newest book Egyptomania: A History of Fascination, Obsession and Fantasy, which, being the 11th of his books, has been drawing international attention. Bellarmine historian Eric Roorda was the featured speaker in WKU Libraries’ Far Away Places series on the evening of March 23, 2017 at Barnes & Noble Bookstore in Bowling Green, KY, on the topic The Dominican Republic: The Land Columbus Loved, or the Land that Loathes Columbus. His talk concluded with him signing his eponymous book. The 2016-2017 season of WKU Libraries’ “Far Away Places” talk series kicked off with Clinton Lewis, WKU’s University Photographer, who spoke about “Exploring New Zealand” at Barnes & Noble Booksellers in Bowling Green, KY on the evening of September 15, 2016. Our opening speaker in our fourteenth season of talks on Kentucky Live! Southern Culture at Its Best was one of the world’s leading tea experts Bruce Richardson, who is a writer, photographer, tea blender and frequent speaker at tea events around the country. The theme of Bruce’s talk in our series was “The Tea Things of Jane Austen,” which took place at Barnes & Noble on the evening of September 8. Book signing ensued after his talk. 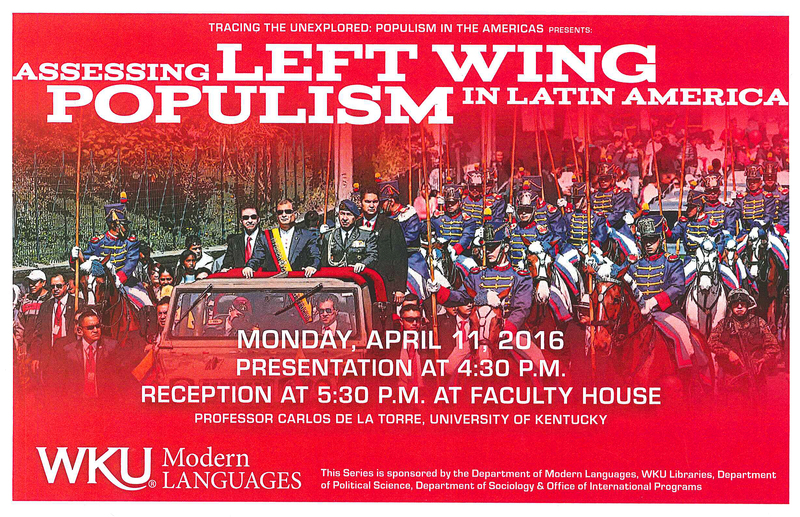 On Monday, April 11 WKU Libraries, in collaboration with the Depts. of Modern Languages, Political Science, Sociology, the School of Journalism and Broadcasting, and the Office of International Programs, hosted Carlos de la Torre, Professor at the University of Kentucky, as part of the Tracing the Unexplored speaker series. A native of Quito, Ecuador, de la Torre moved to the United States in 1979, earned his BA in Sociology in 1983 from the University of Florida, and ultimately earned his PhD in 1993 from the New School for Social Research in New York for his study of Ecuadorean Populism in the 1930s and 40s, focusing on the early career of Jose Maria Velasco. Before coming to UK in 2011 he previously taught at Drew University and Northeastern University, was a professor in the Facultad Latinoamericana de Ciencias Sociales Sede (FLASCO) in Ecuador, was a Fulbright Scholar, a Woodrow Wilson International Center Fellow, and a Guggenheim Fellow. He now serves as International Studies Program Director and Professor of Sociology at UK and teaches courses on topics like Global Racism, Global Populism, and Media and Politics in Latin America. He has authored twelve books, most recently Latin American Populism of the Twenty-First Century in 2013 and Promises and Perils of Populism: Global Perspectives in 2015, as well as contributing occasionally to Spain’s leading newspaper El Pais and maintaining a weekly column in Dario Hoy, Quito’s leading newspaper. De la Torre’s talk focused on “Assessing Left Wing Populism in Latin America: The Examples of Venezuela, Bolivia and Ecuador”, examing why Hugo chavez Evo Morales and Rafael Correa were elected, the similarities and differences among their regimes, and the challenges to their populismand was held at 4:30 p.m. at the Faculty House. The final speaker for the WKU Libraries’ 2015-2016 season of “Far Away Places” was Peter Lorge, who is an Assistant Professor of History and Asian Studies at Vanderbilt University in Nashville, TN specializing in the history of 10th and 11th century China, war history and military thought, guns and gunpowder, Chinese martial arts, and Chinese film. 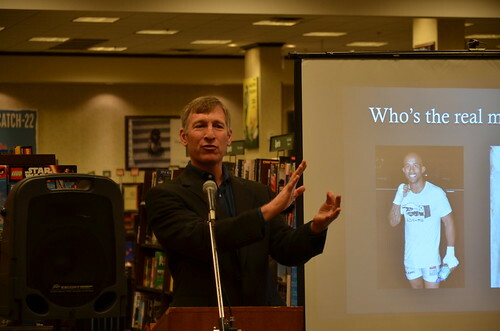 Lorge spoke about his book Chinese Martial Arts: From Antiquity to the Twenty-First Century on the evening of April 22, 2016 at the Barnes & Noble Booksellers in Bowling Green, Ky, a co-sponsor of the event.